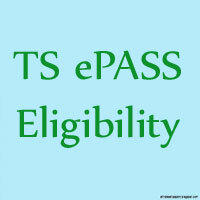 TS ePASS Eligibility Criteria given clearly. Therefore, the Economically Backward candidates should check their eligibility. Telangana State Government providing financial support to the poor students by implementing the “Reimbursement of Tuition Fee”. Hence, the individuals who have low financial Status can avail this opportunity. Lakhs of students who belong to scheduled castes, scheduled tribes, backward classes, minorities, and the physically challenged can get the benefits of Reimbursement. Every year many students are completing their studies in spite of their low economy. Therefore, we advise the candidates to check their eligibility before applying. ePASS is the Electronic Payment & Application System of Scholarships. The Telangana state government has taken this initiative to assist the financially low candidates and thereby helping Nation’s growth. The students who can not pay their fee will get the Tuition fee amount in the form of Scholarship. It is an important welfare measure to enable the students to have access to professional courses. The Professional Courses includes Engineering, Medicine, Pharmacy, Dental Science, Management of Computer courses, etc. Hence, The students should know the Telangana ePass eligibility criteria for getting into the scheme of reimbursement of tuition fee. Through this fee reimbursement, the candidates who can not pay the fee due to their economic status will be benefited. Therefore, we advise the eligible students to make use of this chance and continue your higher education. The Students who belong to the SC, ST categories with an annual income less than or equal to Rs. Two Lakhs are eligible for the scholarship. BC, EBC, Disabled Welfare Students whose parental income is less than or equal to RS. One lakh can avail this opportunity. Candidates getting the Scholarship benefits should possess 75% attendance at the end of each quarter. Students who belong to the categories other than SC, ST, BC, EBC, and DW(Disabled) can not get the Scholarship. SC, ST candidates whose annual income is greater than Rs. Two Lakhs. BC, EBC, Disabled Students whose income is more than One lakh can’t get the Reimbursement Benefits. Students who were getting the stipend more than the scholarship amount in aggregate per annum are not eligible. EBC students who are pursuing Intermediate or Equivalent courses will not be included. BC, EBC and DW students who are studying the Courses offered by open universities, distant education, category B seats in MBBS, BDS. Candidates admitted under Management Quota seats. All Students pursuing the part time courses, online courses also can not get the reimbursement of tuition fee. The students who are pursuing all kinds of courses can not get the fee Reimbursement. Only the Specified Post Matric Courses approved by the University/Board having the duration of 1 year and above can get the TS ePASS Eligibility Criteria. Therefore, Check the courses included under reimbursement here on our site. Pre- Matriculation Scholarships are provided by the Telangana Government. But many of the students are not utilizing due to lack of Knowledge. TS ePASS Eligibility Criteria is given for Technical Graduate and Post Graduate courses like M.Phil, Ph.D., and other post-doctoral research. C.A./I.C.W.A./C.S./ etc., courses, all certificate level courses, all post-graduate, graduate-level diploma courses. Degree courses that are not included Group I & II. Not all colleges have Telangana ePASS Eligibility Criteria. Therefore, the candidates who join in such educational institutions can not get reimbursement. Only a few colleges can get the Telangana ePASS Eligibility Criteria. All Post Matric Colleges in Telangana recognized by Government of State Government of Telangana. The list of colleges is communicated by Administrative Departments like the Department of Higher Education, Technical Education, School Education, Health, Medical and Family Welfare, Employment, and Training to the Commissioner of Social Welfare.